Let’s take a quick look at the hand-sewn applique stitch used on quilts. First, it might be good to look at what it should NOT look like. Note: Brass pin is 7/8 inch long. This is a ‘photo slice” of a section of applique’ that someone sewed. The applique’ is very loose and stiches are between 3/16th to 1/4 inch apart. If this applique were on a quilt on your bed, it could very easily get caught by something – your toe, a cat or dog’s claws, a clothes hanger… and pull it right off. Seriously, I can put my little fingernail between the applique and the background fabric. Applique should be sewn with very tiny stitches, very close together and in such a way so that the thread is barely visible. 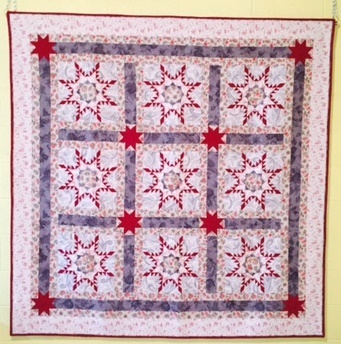 When I first looked at this sample, I thought the maker had used pearl cotton instead of regular sewing thread. The thread looks thicker than regular thread. But after close inspection at the front and back, I can see that it is quilting weight thread, DOUBLED. Applique thread should be of regular sewing weight or lighter. The goal is to not SEE the thread at all. The thread should also match the fabric color of the piece being stitched, or as close to it as possible. For a multi-color fabric, use a neutral color such as grey for your applique. The thread has been matched to the fabric color, and stitches are barely visible. You have to really look hard to see them. Stitches are approximately 1/16th inch apart. Thread matches fabric color. 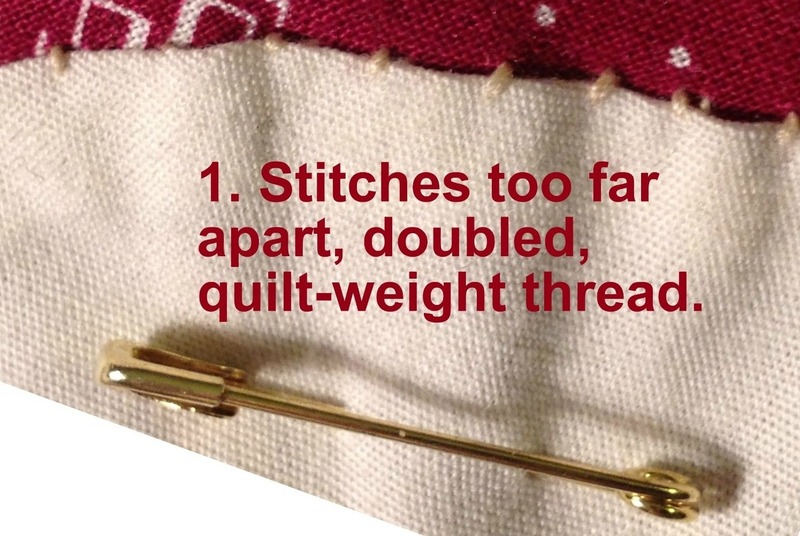 Stitches cannot be seen and are approximately 1/16th inch apart. Amazing and perfect! And yes, I know, there is a grey cat hair on both photos above. Bad Stormie, Bad kitty! Go pull out some of your applique and take a close look. How does your work compare? 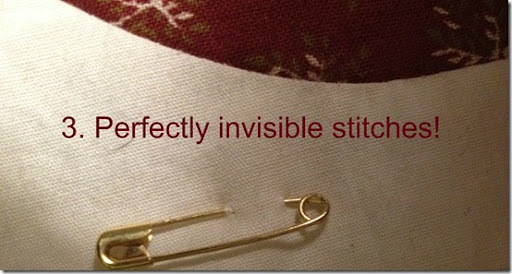 Have you ever tried a hidden running stitch? It really is invisible but I wonder if it is as strong. Julie, Is the HIDDEN RUNNING STITCH the same as a LADDER STITCH? I took a class from Ami Simms and she taught that method. Caron, The first picture looks like my first applique projects. I did not have a book or lesson at the time, did not know what I was doing and wanted to be assure that that little motif was NOT going to come loose. I do not think I did any more applique for twenty years after that. No my hand applique is not anywhere as pretty as yours.